What exactly is Juneteenth, and why should I celebrate? The other day I was at work, barely working, when I looked down at my calendar and noticed today was Juneteeth. I was filled with joy and elation that today was a holiday, till I realized that I have no idea what Juneteeth is or why it is on my very professional desk calendar. Thus, I began my research. And, like any good researcher, I began on Twitter because even the most abscure things seemed to have begun on Twitter. So what exactly is Juneteeth? From there, I decided to dig a little bit deeper and learned about America's Second Independence Day. Juneteeth. On June 19th, 1865 Texan slaves finally became aware of the emancipation proclamation. The emancipation proclamation, issued by Abraham Lincoln in 1863, generally marks the end of slavery in the United States. However, it took a little over two years for the new to spread to Texas. 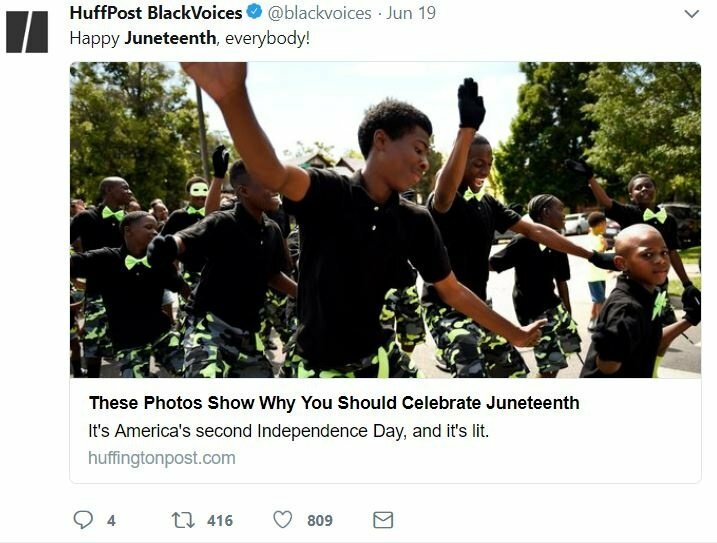 Since, Juneteeth has become can African American tradition to celebrate the freedom of Texan slaves who had learned about their freedom two years later than the rest of the United States. Great job Texas! But how does one celebrate Juneteeth? From what I found, it is a lot like any other holiday. You gather the family. You make some bomb food. And you talk about the history behind Juneteeth. You initiate the conversation. Speak about how far we have come and how far we have to go. As an African American, I am ashamed to say that I have never heard of Juneteeth prior to Juneteeth 2018. However, I am more angry that I was never taught about Juneteeth in school. It goes to show how little we learn about Black American history, even though we have a whole class based around American History in high school. I can tell you a fun fact about the majority of the United States Presidents, but I had no idea what Juneteeth was. If it is important enough to be on my very profession desk calendar, then why is it not important enough to be taught in schools? Now that I have learned about the importance and history of this holiday I will be sure to celebrate it every year, and spread the background behind this holiday because everyone deserves to be educated.